Location: Le Bourgneuf-la-Forêt, in the Mayenne departement of France (Pays de la Loire Region). 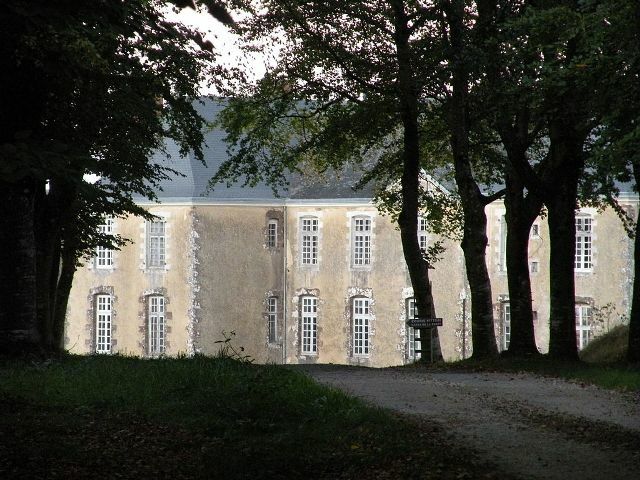 Notes: Château de Fresnay, is located 1.2 km north of Bourgneuf-la-Forêt in Mayenne. Mentioned by Hubert Jaillot ("castle, chapel, pond and moors"), the Cassini map ( "Castle, town and log with convergent paths") and Pierre-François Davelu ("Beautiful castle and chapel"), Fresnay was a fief and moving area of the lordship of La Forest, and fief, three times and liege homage to the manor Ernee. The lord of Frenay who have put a seat in CHANCEAU the church in 1492, he recognized that this would not prejudice the rights of the Lord of the Forest. Moreover, the acquisition of this importance without territorial fiefdom soon freed the lord of Frenay this vassalage. The present castle, double pavilion forming hammer, not earlier than the seventeenth century. Land has always been inhabited by its owners.